I didn’t feel up for another early adventure the next day, so we slept in a bit and decided to spend the day visiting Volcanoes National Park. First we stepped across the street for a mocha at Daylight Mind and wound up ordering breakfast as well, enjoying the morning on the sunny balcony and the slices of fresh avocado, pineapple, and baby cress adorning our plates. When we returned to our room, the key pad (which had worked perfectly so far) refused us entry. We called the owner who sent us up to the security desk for a new code. Thankfully, helpful Dusty was there and we soon had a new number to try. It failed. We came back and she gave us another number to try while she was on the phone; it too failed. With mounting frustration, we returned again and waited for Dusty to get off the phone. She followed us back down to our room and managed to come up with a code that worked. So by the time we were packed up and on the road, it was nearly noon. We headed south for the first time, into lush hillsides quite unlike the landscape and vegetation north of the town. 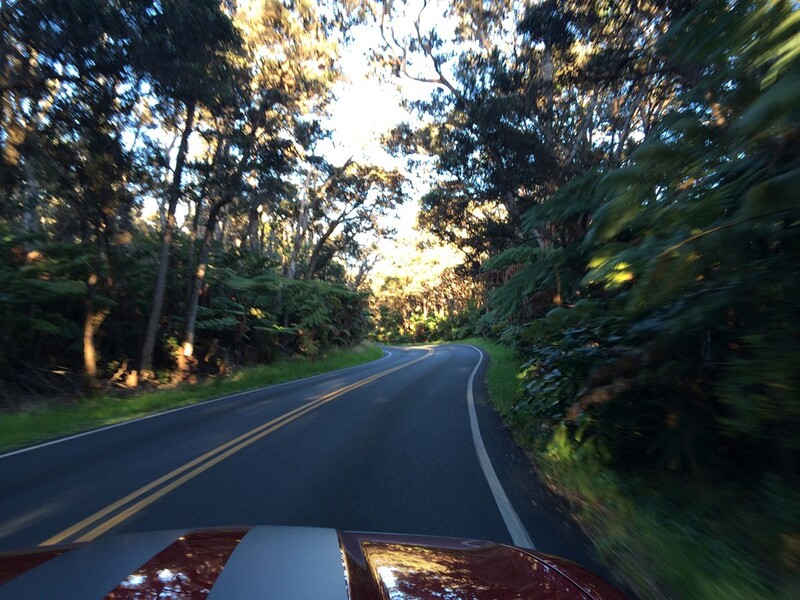 Highway 11 is narrow, skirting the edge of the mountain at about 1,000 feet through small towns hugged by ancient trees, bursting with flowering shrubs, and adorned with neat rows of what we soon guessed were coffee trees. It was beautiful country, if a bit slow going at times. 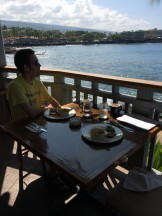 The Big Island, we realized yet again, is really big! 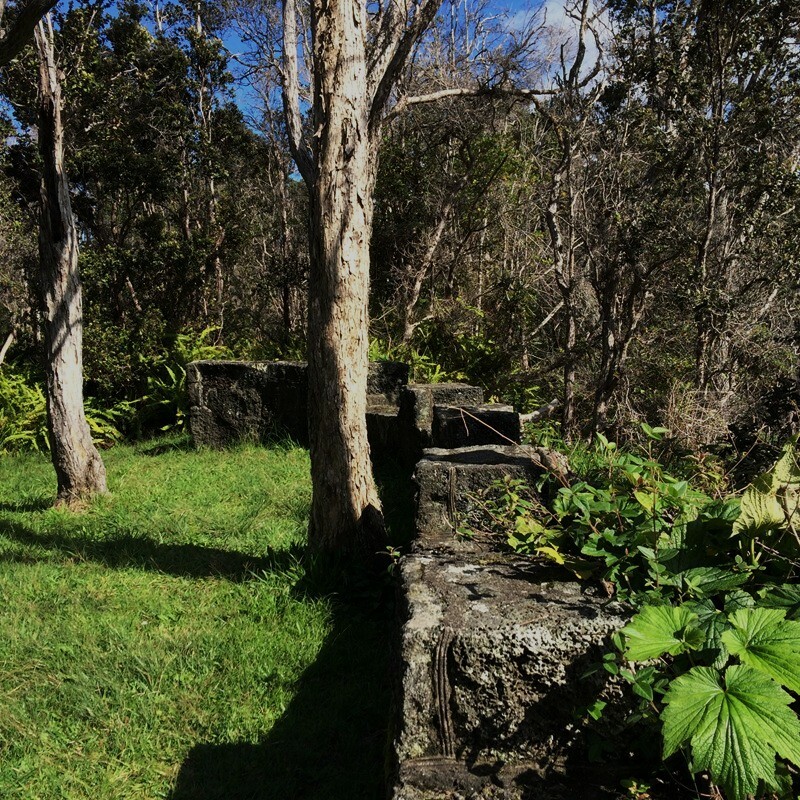 It took us a surprising amount of time to round the southern tip of the island where the vegetation became sparser, pasture-like in some areas and increasingly scrub-like as we turned east. 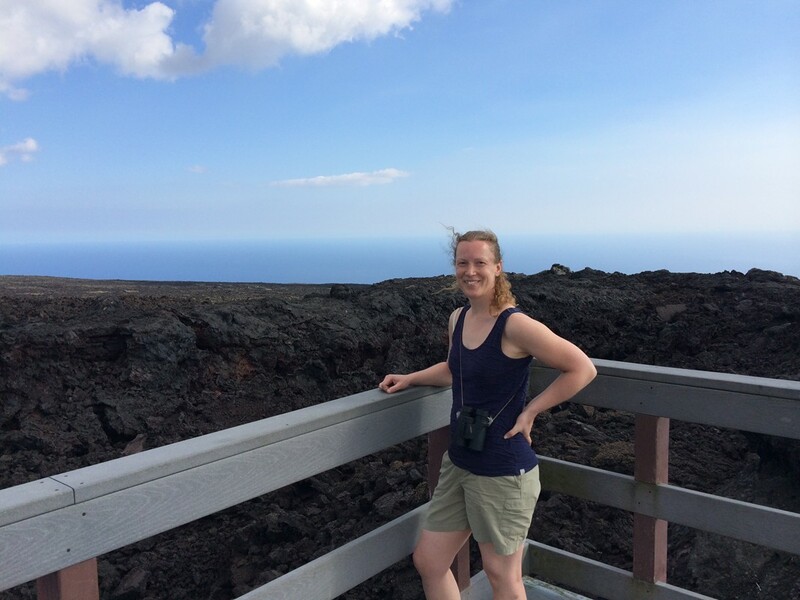 Two hours after leaving the hotel we arrived at Volcano, stopped briefly at the visitor’s center, and changed seats. 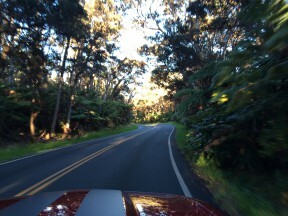 I immediately took a wrong turn and we wound up on the crater rim road instead of the chain of craters road. 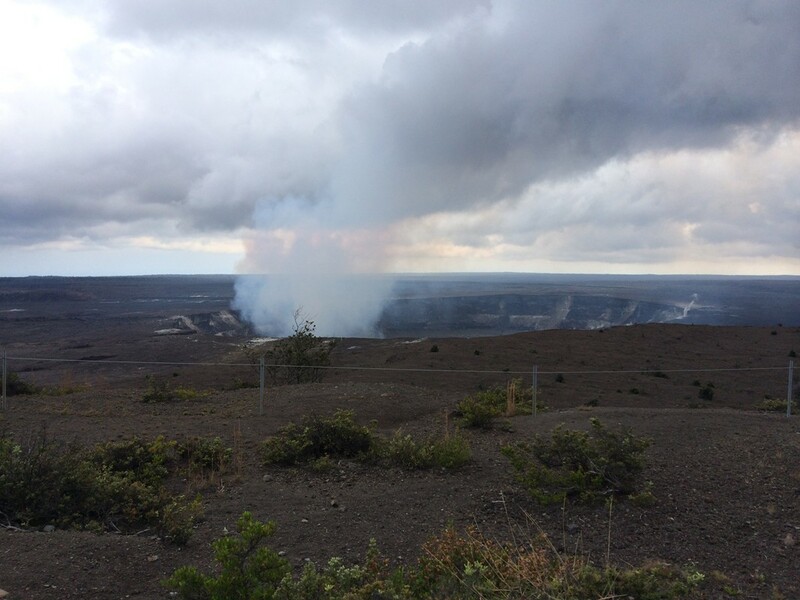 But, it only took us a few minutes to drive all the way to Kilauea crater (photo to right), one of two places where the volcano was active at the time, so we got out and looked into the steaming chasm. A cloud of sulphur dioxide rose from within and drifted west, but it was too light to see the lava inside. On the way there we’d passed steam vents and watched (not without a little horror) the spectacle of tourists posing within arm’s reach of the steam. We turned around (even if we wanted to continue in that direction, the road is closed due to toxic gases) and headed back past the visitors center and down the road in the other direction. 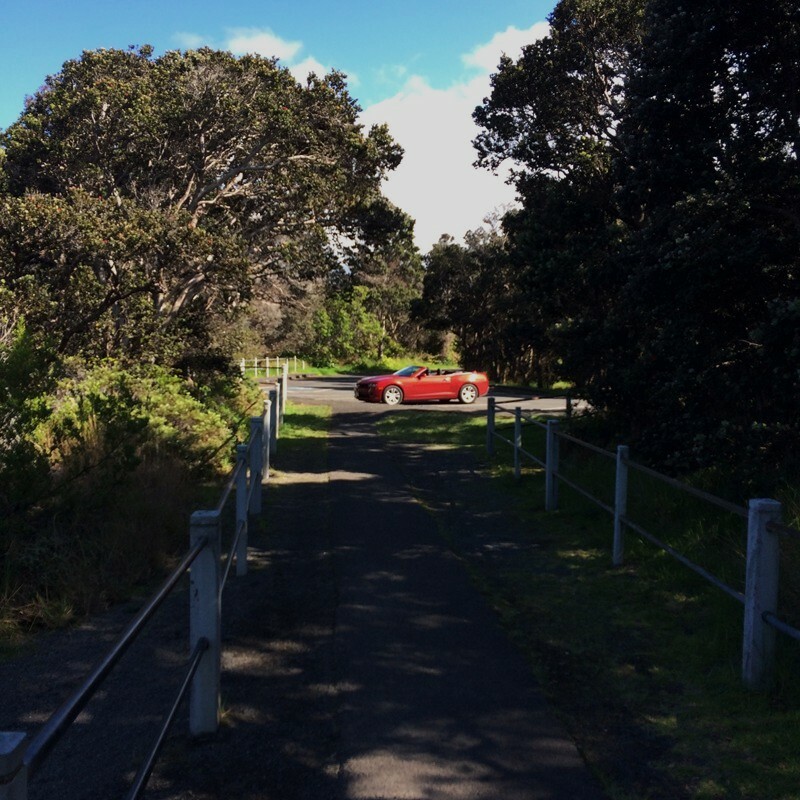 The road was a delight—twisting amiably through a surprisingly jungely landscape, bird song erupting from all sides into the open convertible (perhaps one of the best features of the convertible). 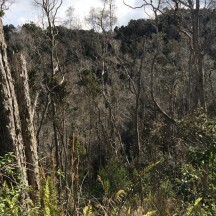 Apparently that area—so close to the active crater and nearby devastation—had avoided any recent contact with lava and was a mature rainforest (using that term lightly here). 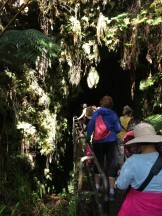 Our first stop was the Thurson lava tubes. 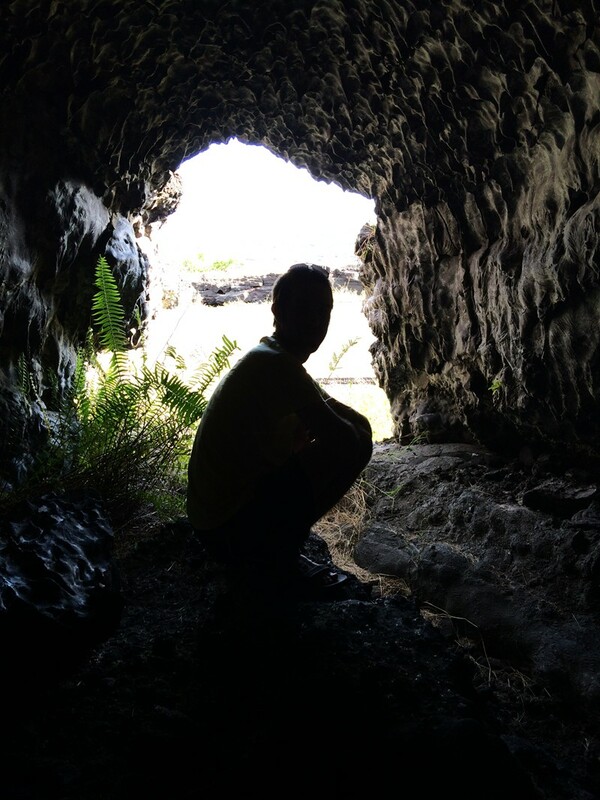 I had a bit of a stomach ache at that point, so I lay down in the back of the car for a few minutes; in the meantime, at least one bus full of tourists showed up, so by the time we hit the trail to the lava tube it was one long queue of shuffling humanity. 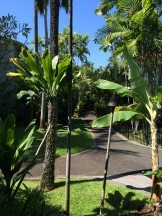 Although I itched to walk faster, it was about as pleasant a place to linger as I could ask for. 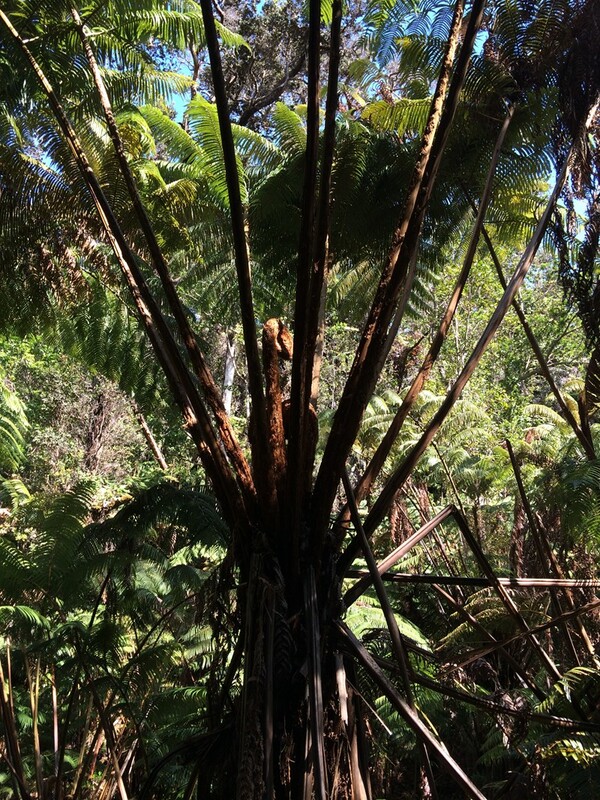 Giant tree ferns (hapu’u) dominated the landscape, with head-sized, furry fiddleheads ready to unfurl. Bird song sprang from all around, but my attempts to see them entirely failed. 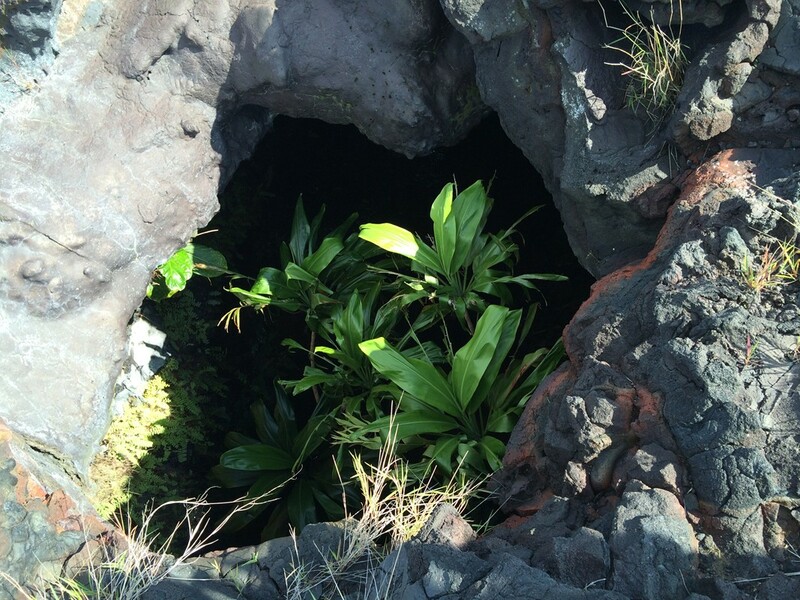 The lava tube entrance was at the bottom of what looked like a round gully (or maybe a crater?) and we wound our way down past increasingly impressive vegetation. At the bottom, the cave entrance dripped and loomed, small ferns clinging to the edges. It was wet and cool inside—with mud puddles here and there on the floor—mostly tall enough to stand up comfortably and about ten feet wide. In one place tree roots hung down several feet from the top. 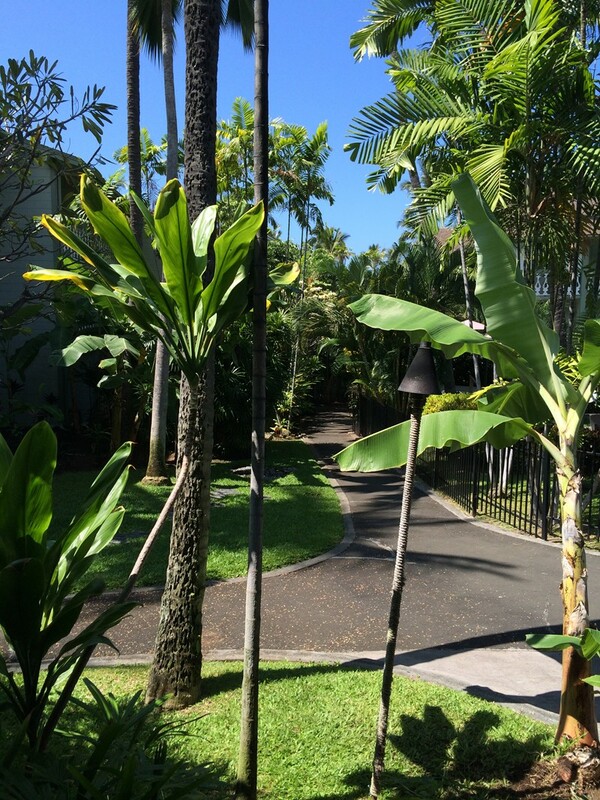 In a place like that, I could see how native Hawaiians could have used such locations for collecting water “drip by drip” as I read in the brochure. 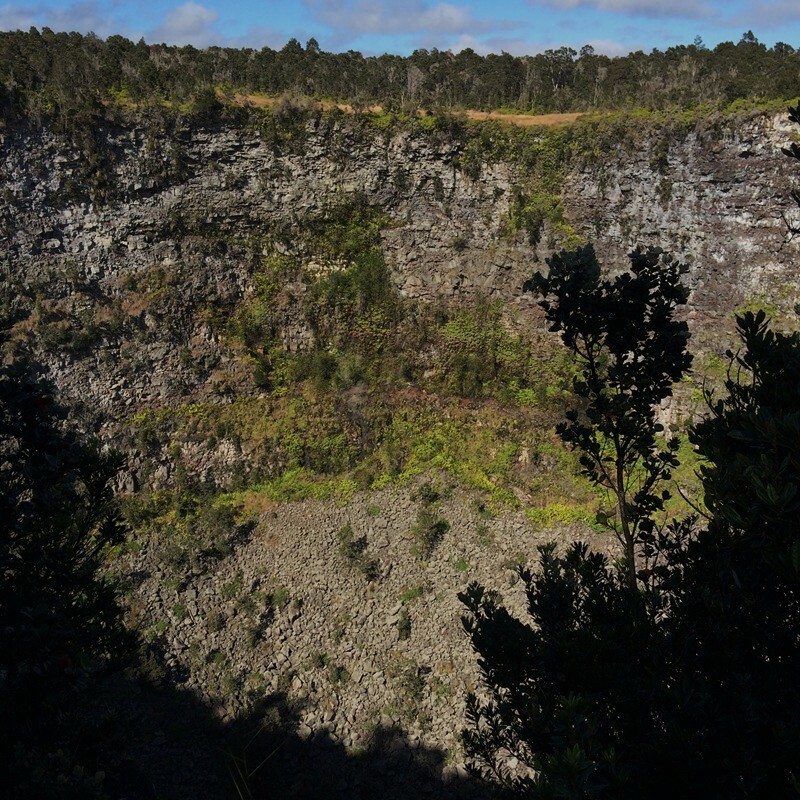 Puhimau Crater (.9 mile): The small parking lot was deserted—a good sign—and we walked just a few feet to gaze over the edge of this pit crater. Five hundred feet deep and about that width, it’s a classic pit crater, formed from the sudden draining of magma beneath the surface and the subsequent collapse at ground level. Often beginning life in the shape of an inverted funnel (larger underground), this crater, like many others, had eroded away into straight walls in the shape of an oval. We were excited (?) to see steam seeping from fissures in the far side which seemed to build as we watched. 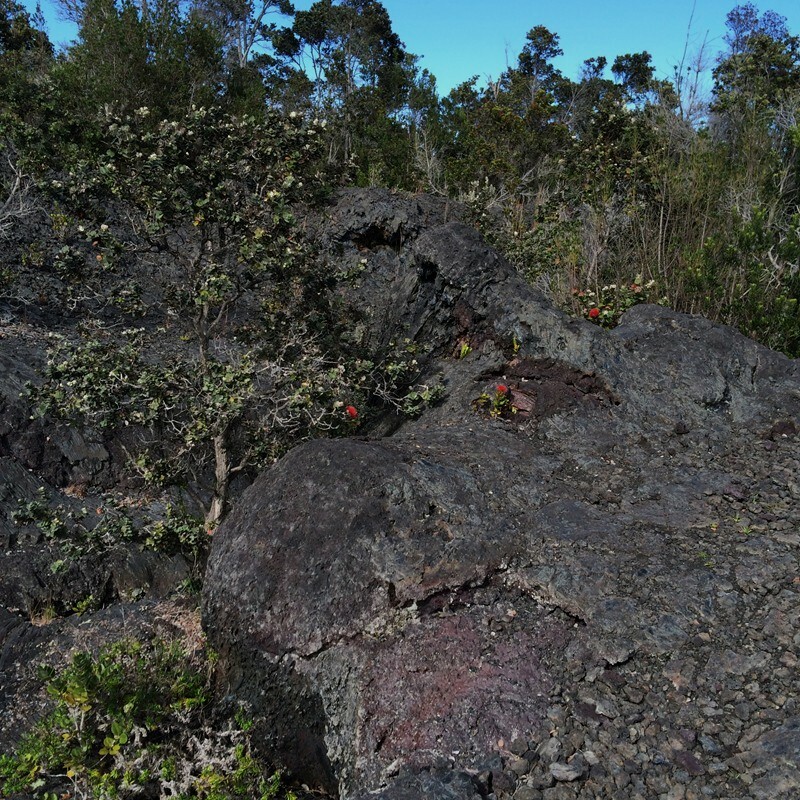 O’hia lehua trees with their bushy red flowers bloomed around us and the air was alive with the same red birds I’d caught glimpses of at the lava tube. This time I got a better look and watched them feeding in the o’hia flowers. After spending considerable time searching for them in my bird app (which does include them), I finally thought to look for them in the lovely park brochure which includes a drawing of local plants and animals and a key to identify them. Not surprisingly, I was able to quickly identify both the ohi’a plant and their occupants: ‘apapane birds, endemic to Hawaii! 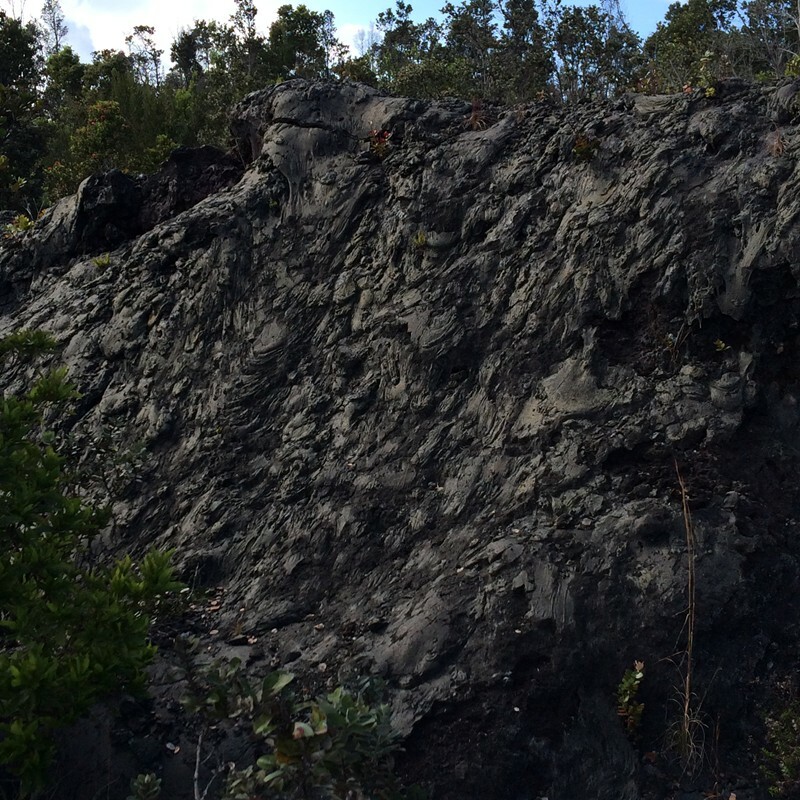 Ko'oko'olau Crater (mile 1.5): We pulled over to see what an older crater looks like after 200 years of inactivity. 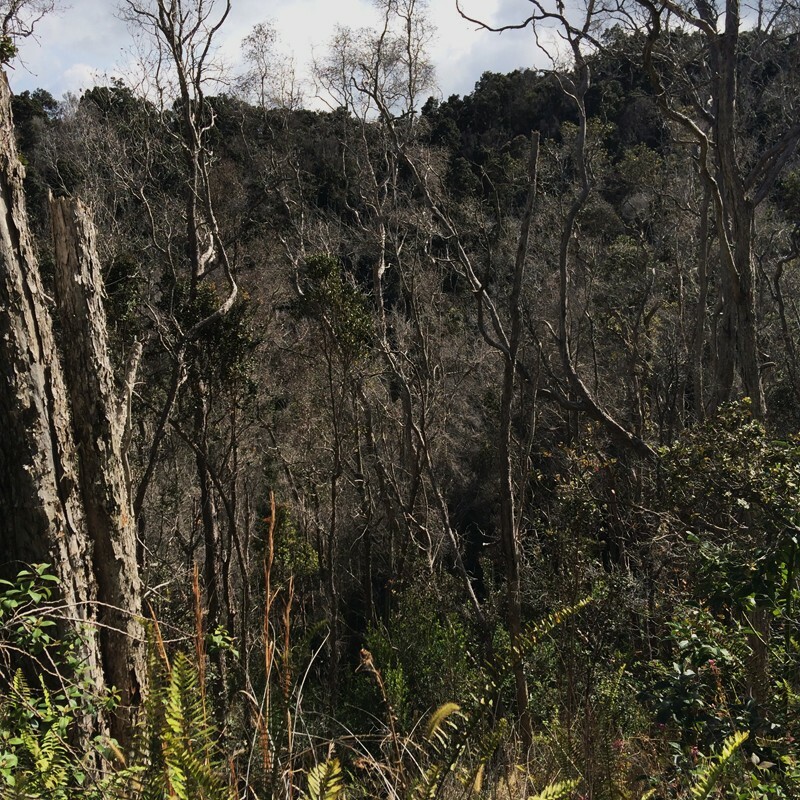 The edge of the crater was just off the side of the road and was chock full of vegetation; I’m not sure it would have been immediately recognizable as a crater it was so dense. I enjoyed the old stone wall which formed a loose fence at the edge. 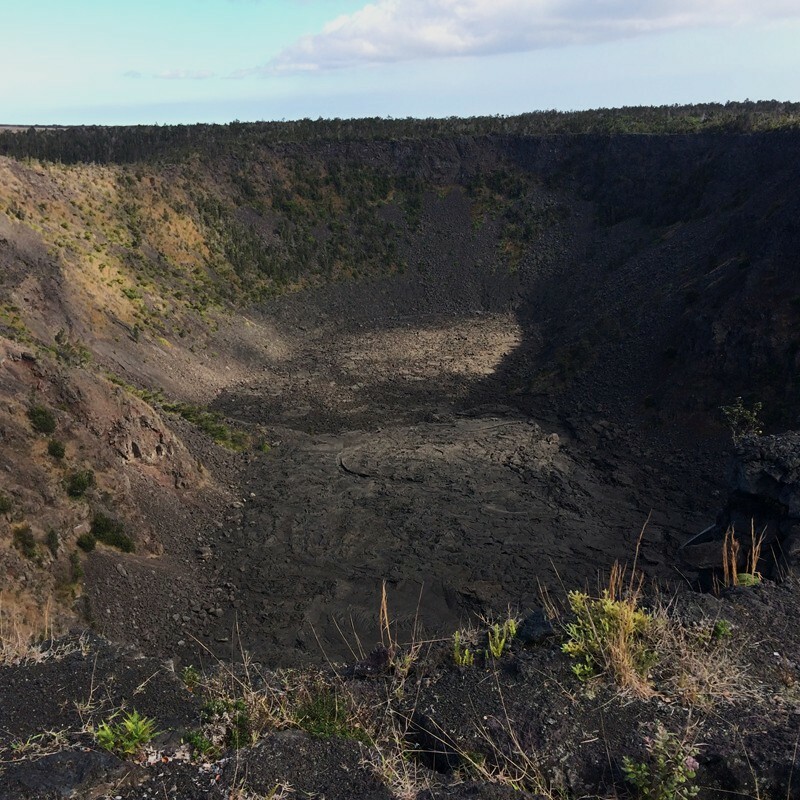 Pauahi Crater (mile 3.1): We also had this crater all to ourselves when we first arrived. 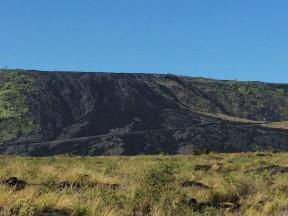 A short trail allowed us to look down the enormous (1800’ x 300’) Pauahi Crater. Although the crater itself is old, it erupted in 1973 and 1979 and filled the bottom with lava, making a kind of lake of lava clearly visible over the bottom. 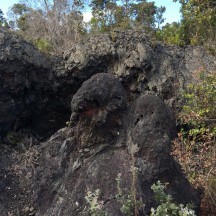 Even more interesting than the crater and its congealed lava lake were the lava formations just behind us. 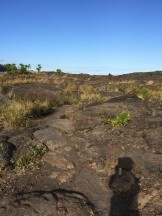 Although signs asked us to stay on the trail, we followed the advice of the web site and strolled through a nearby fissure of lava where many others had clearly gone before. Fissures in that area had spewed lava in the past where it splashed onto existing structures and created crazy formations in bright metallic colors (see photo to right). Our next stop was meant to be the road to 'Ainahou Ranch which we intended to walk in the hope of encountering the endangered, endemic nene, Hawaii’s beautiful relative of the Canada goose; nenes eat the berries of the ‘ohelo, a relative of the blueberry, and have evolved into a more terrestrial lifestyle than their cousins. Herbert Shipman built the ranch in 1914 and is largely responsible for the recovery of the nene. However, the mileage ticked by so fast that we managed to miss the turnoff to the road (I was probably distracted by trying to identify the ‘apapane birds), which was unmarked, and decided to try it again on the way back. Muliwai a Pele (mile 7.2): That meant that our next stop was in the middle of a lava field from a 1974 eruption. 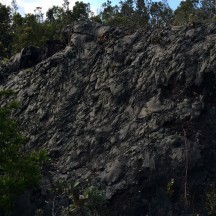 A muliwai is essentially a lava channel, a trough formed by flowing lava where the edges harden and guide the flow. 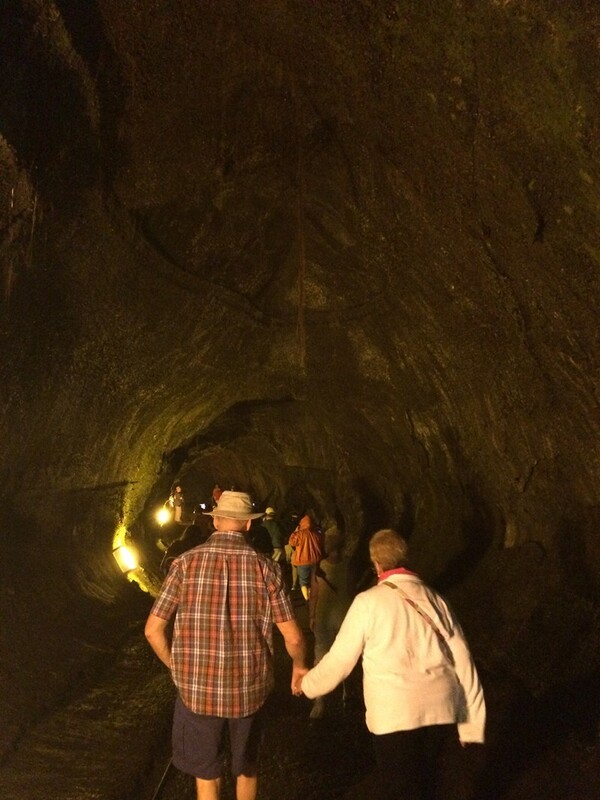 When the eruption stops, the muliwai drains and the channel is left behind. 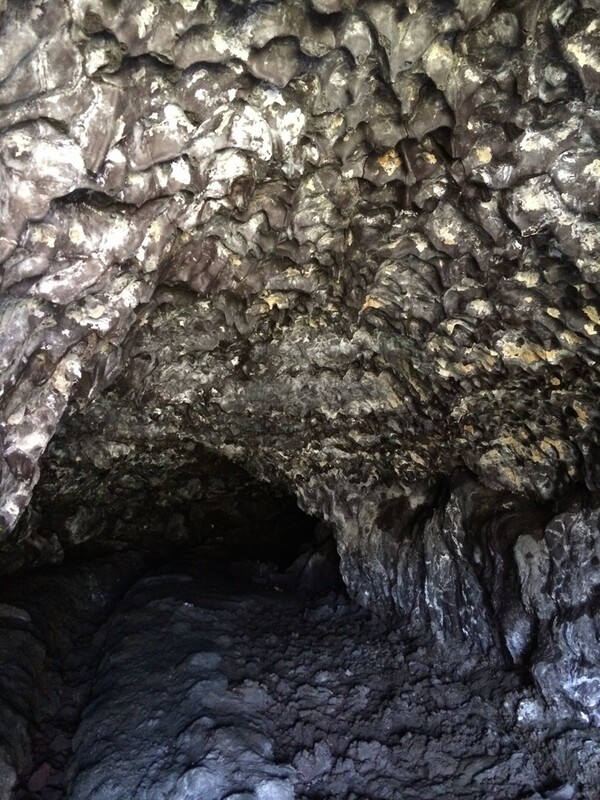 I think this is how lava tubes form, too, but lava tubes have hardened over the top too. This was interesting, but not a particularly exciting stop. 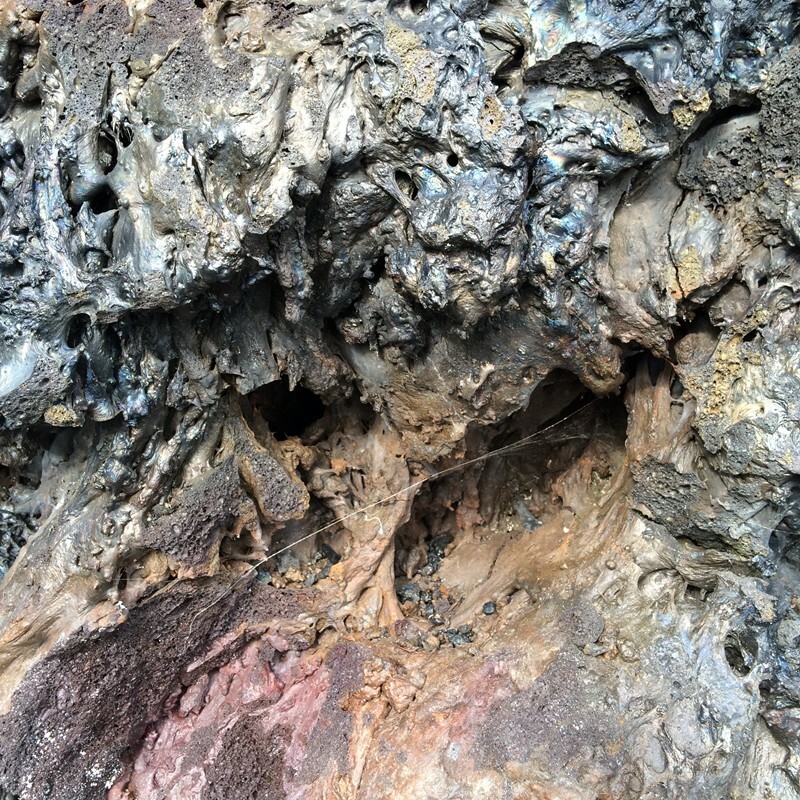 Not much farther along is a neat formation on the right side of the road where flowing lava forced a chunk of hardened lava up from below where it juts above the surrounding lava field at an angle. 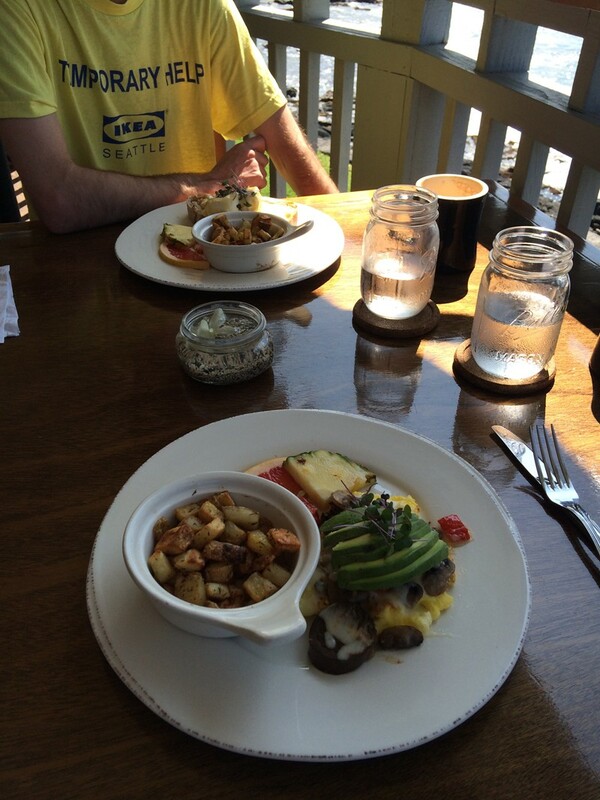 Am I one of those people who takes food pictures? From there the road began to drop steeply toward the coastal plain. 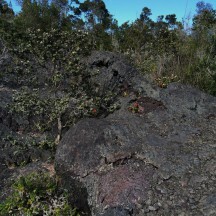 The map of the park in the brochure, which looked so barren (compared to the lush tropical vegetation closer to Kilauea) suddenly captured the stark landscape perfectly. 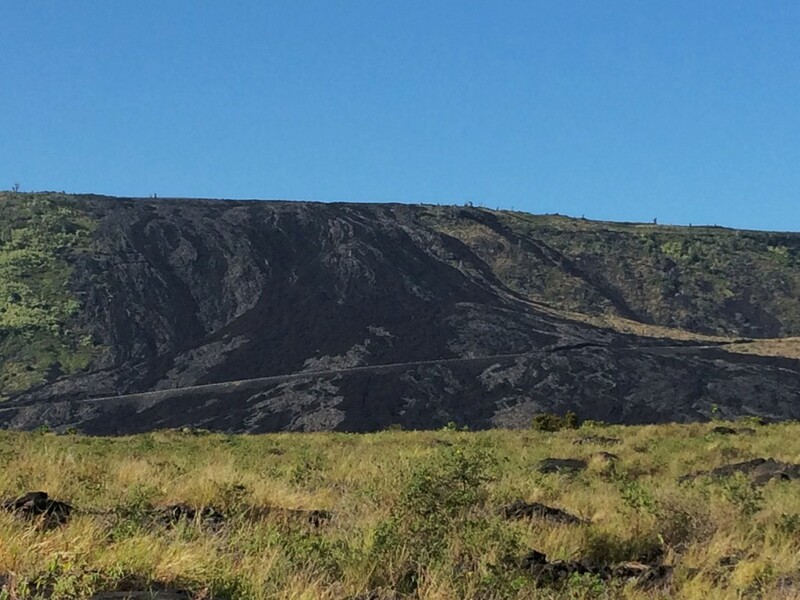 What wasn’t recent lava flows was sparsely vegetated with grasses and other low vegetation. A steep escarpment dropped to a flat plain of devastation and the choppy ocean beyond. The view down over the plain was a good lesson in the formation of new land on the islands, one lava flow after another inching out into the ocean. As Chris wound down the tight switchbacks, I looked back at the steep slopes and the hardened lava that had poured down, frozen in time. Not far after we leveled out again, Chris spotted the pullout to the lava tube tumulus (mile 14.9) I’d read about on my helpful web page but which was not marked or advertised by the park service. 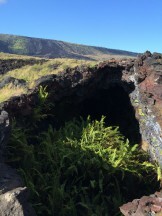 A tumulus is a lava tube that has been pushed upwards above the surrounding ground by pressure buildup inside, forming a hill. We first climbed on top and along it, astonished at the lush vegetation growing inside the holes (skylights) that had crumbled away. 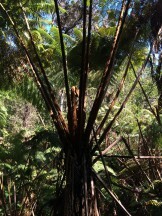 The biggest one was grown up in ferns; a smaller hole had ti plants growing out of the top. The web page suggests that the ti plants may have been planted as offerings by Native Hawaiians. It did seem surprising that the seeds and spores of such plants would accidentally make their way into these few hospitable environments in the desiccated coastal plain, but it doesn’t seem impossible either. 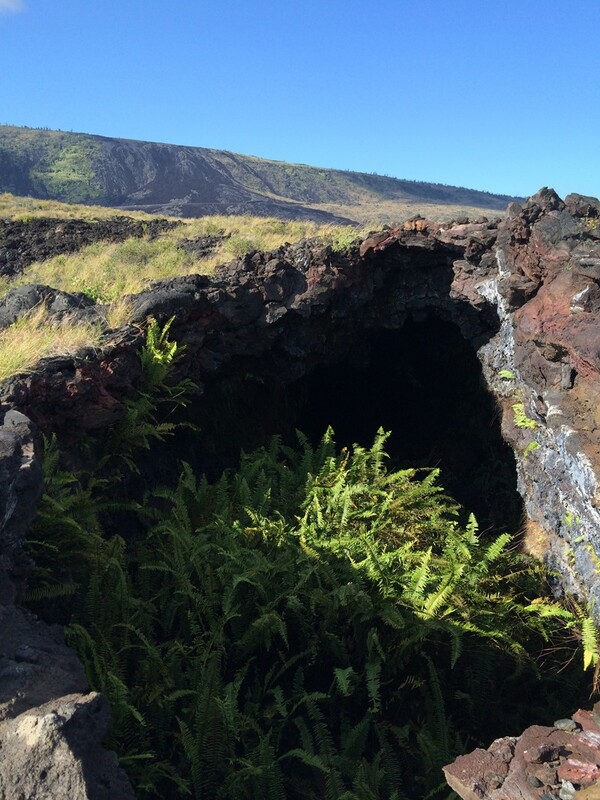 Just the fact that a relatively small cavern could produce enough moisture to harbor such plants was amazing. After walking along the top, Chris discovered a ground-level entrance to the same tube on the opposite side of the road and then a large ground level opening to the main tube back on the original side which we had entirely missed in the beginning. 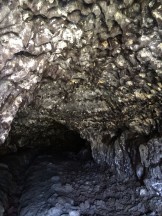 We crawled in a few feet, noticing the stalactites of what I assume was cooling lava undulating across the ceiling. 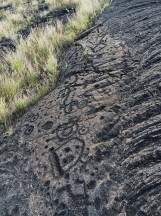 Pu'u Loa Petroglyph Field (mile 15.9): In the middle of the coastal plain, we pulled over alongside several other vehicles and began a ¾ mile walk to the largest petroglyph field on the island, the location of thousands of petroglyphs. The walk itself, though stifling, was pleasant and interesting. The trail was discernable but subtle on the landscape, often marked by cairns. 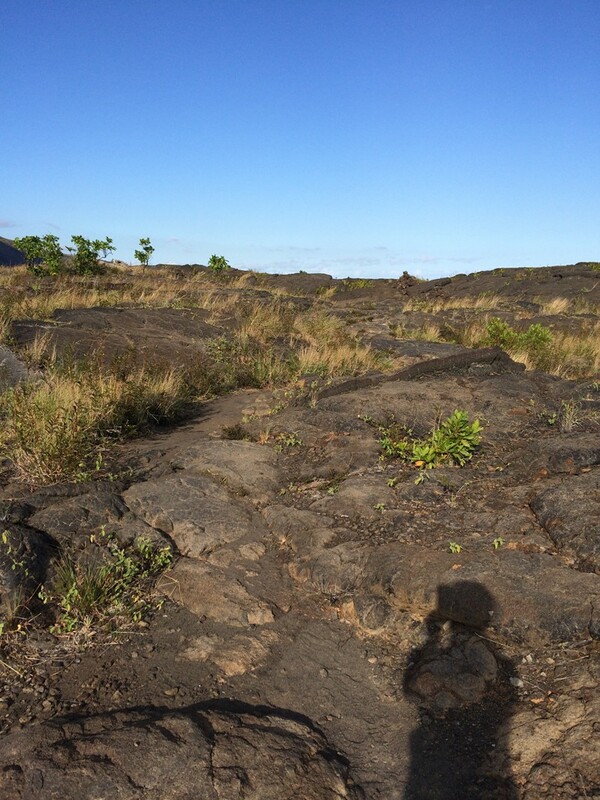 Tufts of grass and other low, arid vegetation grew amid lava rocks and patches of sand. 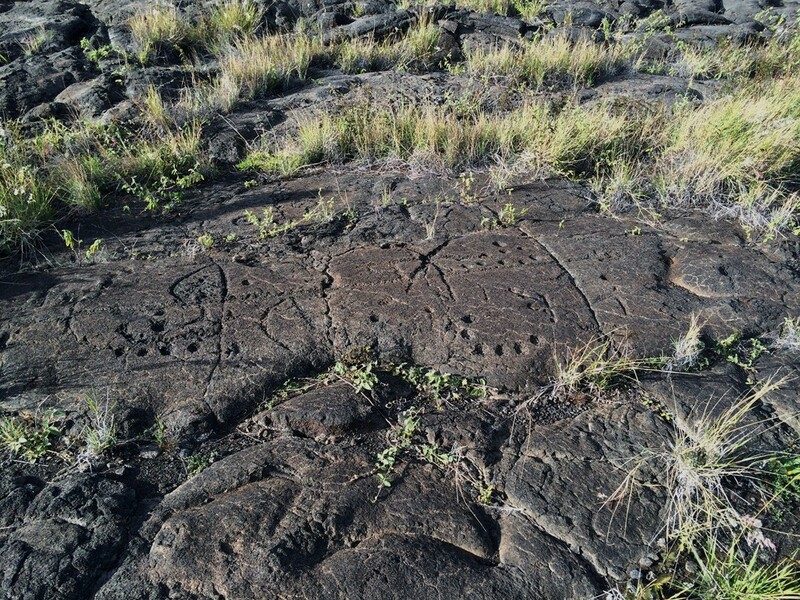 An interpretive sign pointed out an area where native Hawaiians had grown tubers among rocks they’d piled in a little corner against a mound of lava rock where moisture would collect. At the end of the trail, a small boardwalk looped through the field, hundreds of petroglyphs around it. The field extended well beyond the boardwalk, but we obeyed the guidance to leave it alone. 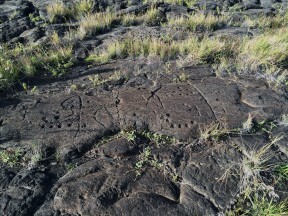 My favorite petroglyphs were the human figures. 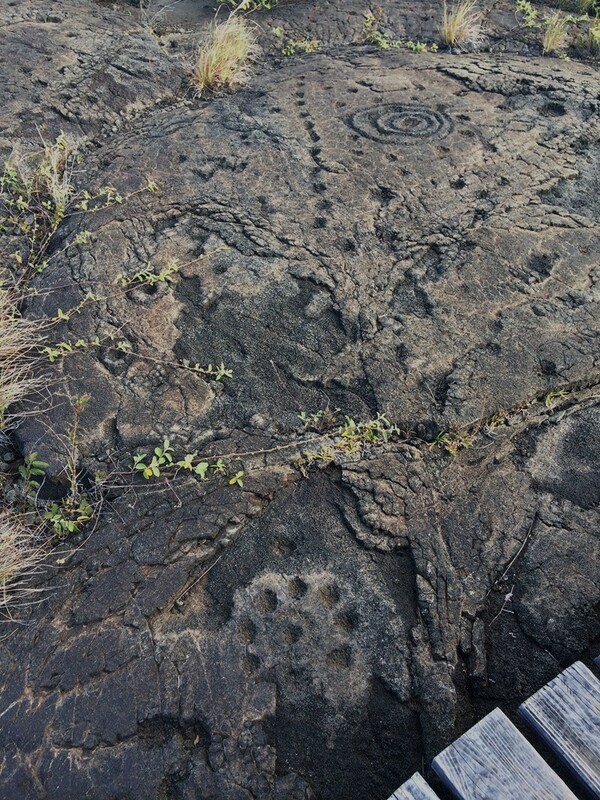 Some of the others I couldn’t interpret at all, but the vast majority were small circular divots, sometimes encased by full circles, sometimes carved in a line, sometimes making part of a circle themselves. 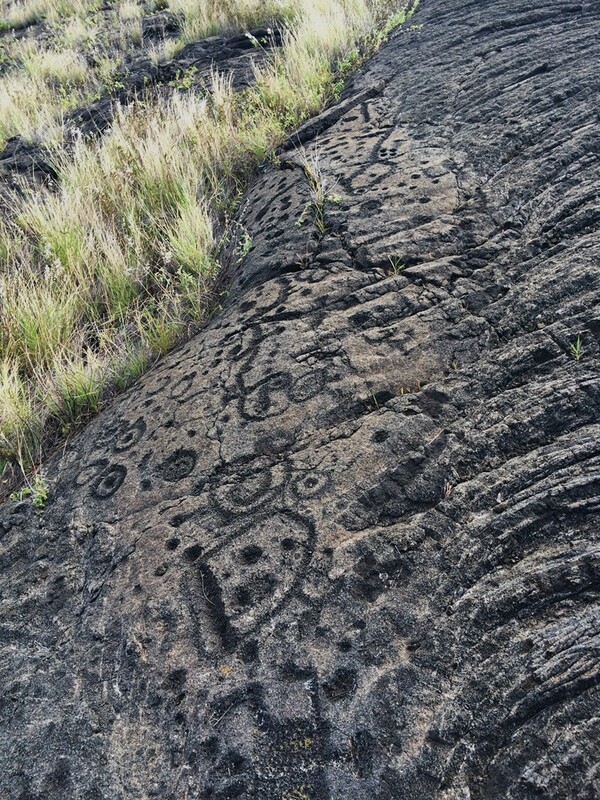 An interpretive sign explained that the umbilical cord of Hawaiians from that region were traditionally buried in a divot with a stone placed over the top. 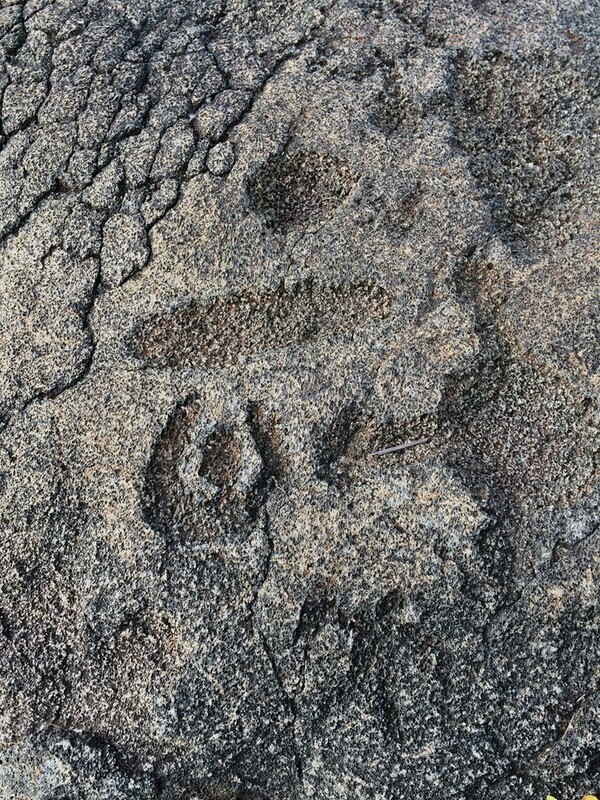 Presumably, most of the stones had long since scattered, but we did see a few suspiciously out of place stones in the area. By the time we got back to the car we were hot and thirsty and the day was winding down. 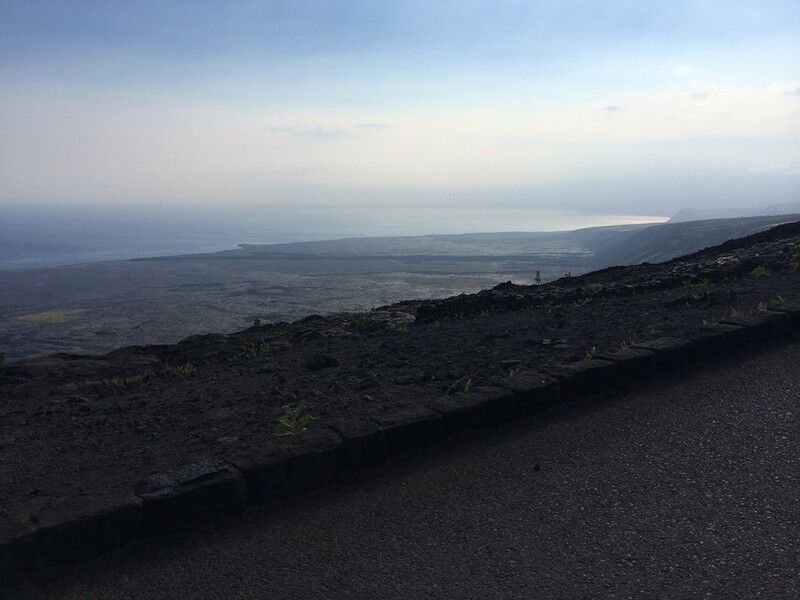 Since no lava at that time was flowing into the ocean or anywhere near where we could see it (other than in the crater we’d already seen it was above ground in only one very isolated spot to the east), we decided not to finish the drive to the coast. The road is blocked a mile from where the 2004 flow crossed the road, and we didn’t have the time to make that walk even if it was inspiring (pictures would have been neat, but we had other things to see). 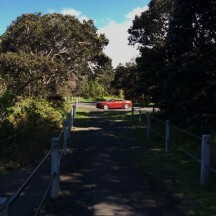 And so I took the wheel and headed back up the road. A few miles shy of the turnoff to the ranch I saw an oncoming car swerve toward my side of the road a little and spotted the nene he’d avoided on the side. It was a fleeting look, but recognizable. In retrospect I wish very much that I’d turned around for another pass, but we were still expecting to see some at the ranch. Unfortunately, a sign was posted that the area was closed until further notice. Though no one was there to enforce it, we obeyed and left the park. By that time it was late in the afternoon, but we kept our eyes peeled each time we saw another nene sign. Just as we passed one, Chris saw a likely candidate on the side of the road, so I turned around as soon as I found a good place and we actually found the bird crossing it. 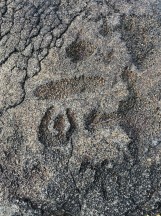 I saw it on the asphalt and Chris had a better look as it disappeared into the bushes on the opposite side. My guess is that it was a game bird of some kind, but it wasn’t quite right for a goose. 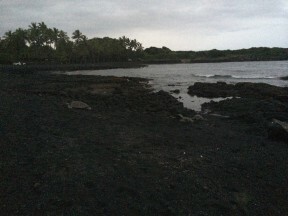 We turned around and sped our way to the turnoff to Punalu’u Beach, reaching it at dusk. The last of the beach goers were fleeing as we pulled up, but we trudged down the beach in the fading light. Sure enough, I spotted a turtle in the middle of a large ring of rocks behind a sign that indicated we should stay at least 18 feet from any sea turtles. 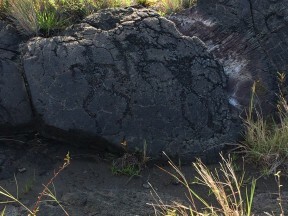 Closer to the water, three other turtles rested on the black sand at the head of some channels through the lava rock. It was nearly dark by then, but I was happy to have seen the beach and the turtles who come to rest on the warm black sand. The rest of the ride back was a long marathon in the dark. The road was unlighted and, perhaps for the first time, I really appreciated the multitude of reflective lights on the road and the road signs, which lit up the night like a space ship as I drove. Taking into account time lost for chasing nenes and the stop at Punalu’u, I think I made the drive in two hours and fifteen minutes. 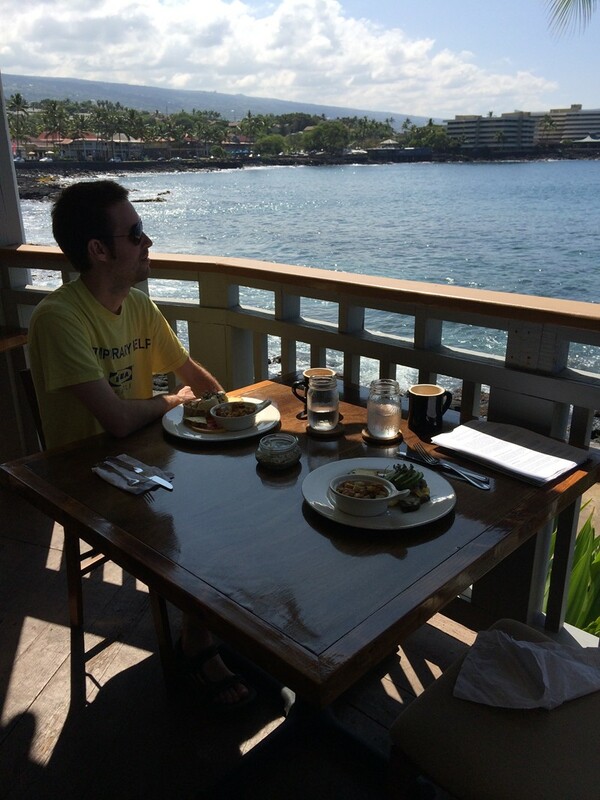 Having only snacked for lunch, we were both pretty hungry by the time we approached Kailua and were dreaming of Ultimate Burger. Chris checked to see if they were open (they were—until 9:00) and we cruised in for dinner around 8:30. Having driven with the top down for a couple of hours, I was chilled enough to order the chili with melted cheese on top. Yum!